PMC-5231M-3GWA is the new generation of Power Meter Concentrator for meeting the trend of energy saving and carbon reduction in the Industry 4.0 age. It provides flexible integration with the ICPDAS power meters via RS-485 or Ethernet interfaces and features various functions such as: measure the power consumption of the devices, energy usage analysis, power demand management and alarm notification functions. The PMC-5231M-3GWA features a built-in Micro SD card. After retrieving the power data from the power meter, it will save the power data in data log file, and automatically send back the data log files to the back-end management center for data analysis and statistics. PMC-5231M-3GWA offers a user-friendly and intuitive web site interface that allows users to implement an Energy monitoring and management system with just a few clicks; no programming is required. In addition to ICP DAS XV-Board and M-7000 I/O modules, the PMC-5231M-3GWA can also connect to standard Modbus TCP/RTU Slave modules. By working with the I/O modules, and functions such as IF-THEN-ELSE logic rule execution and alarm notification functions including Email/SMS/LINE, the PMC-5231M-3GWA offers more thought-out power demand management and alarm notification functions, and is able to perform load shedding of the devices if required, and enables real-time monitoring and control of the power consumption of the devices. PMC-5231M-3GWA also supports the Modbus TCP/RTU, SNMP, FTP and MQTT protocols for seamless integration with the back-end SCADA/MES/IT/IoT/Network Management systems. So that the administrator can monitor the status of power consumption of each device and perform statistics and analysis of the power information, thus improving the overall efficiency in electricity consumption to save costs on utility bills. All of these features make PMC-5231M3GWA a perfect concentrator of power meters in the Energy monitoring and management application of Industry 4.0 age. Support at most 24 ICP DAS Modbus Power Meters (with maximum 16 ICP DAS Modbus TCP Power Meters) and 8 Modbus I/O modules. COM3 and COM4 interface can connect to Max. 16 power meters individually. 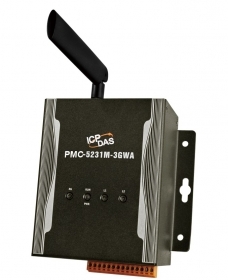 Support at most 4 ICP DAS PM-4324 series Power Meters. Display real-time or historical power data; Provide power data statistics report. Provide alarm message notification function via Email, SMS or LINE. COM 3 RS-485 (Data+, Data-), non-isolated, Speed: 115200 bps max.